spherical geodesic grid. Source: Prabhat, LBNL. In my QUEST radio story this week, we learn about how faster supercomputers will help scientists run climate simulations. One of the trickiest aspects of that is dealing with clouds. To find out why, I sat down with Bill Collins, head of Climate Science Department at Lawrence Berkeley National Lab. How important are supercomputers to climate change science? We understand the climate by making observations using satellites and ice sheets. But the only crystal ball we know about, short of a time machine, is the supercomputer. We started with by running simple climate models on supercomputers that included simulating the weather, rainfall, and carbon dioxide. In the last 20 years, the complexity of models has vastly increased. They now include ocean dynamics, glaciers, sea ice and the exchange of carbon dioxide between the ocean and the land, known as the carbon cycle. All of that has required an immense increase in computing power. Climate models today simulate the atmosphere and carbon cycle by breaking up the planet into a grid and running the calculations in those segments, right? Right, in modern climate models, we simulate the weather every two to five minutes and then average that to see how the climate is going to change across that grid. 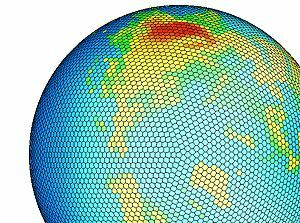 We simulate the weather in segments that are 25 kilometers wide. Our goal is model something the size of San Francisco County, which is about 10 kilometers wide. Once we get to that scale, we’re going to be able to provide local projections of climate change. We’re honing in, but we’re not there yet. We need bigger computers to get there. The other reason is we’d like a higher resolution is that we’re having to make educated guesses about certain things, like clouds. And those educated guesses are a source of uncertainty. Cloud systems can be very large or very small. We don’t know how they work at the large scale, but we do know how they work at the small scale. So the trick is to simulate them at the small scale. What role do clouds play in the climate? Clouds stabilize the climate. They reflect sunlight, so they act like a sun shield. But they also trap heat from the Earth. They both heat and cool, but their net effect is to cool the planet. So the question is, what happens if climate change makes the cloud cover decrease or increase? Understanding how clouds will be affected by climate change has become a critical question. Where clouds form in the atmosphere makes all the difference. High clouds reflect sunlight, but they’re mostly very efficient blankets. Clouds low in the atmosphere aren’t very good blankets. They act as a big sunscreen, reflecting energy. 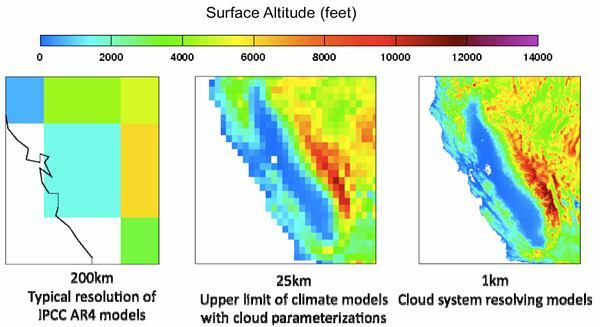 How do climate models today treat clouds? Models today represent clouds throughout statistical methods over large areas. That models their effect, but not really how they work. And you don’t want to assume how they work now is how they’ll work in the future. We want to get to a level of physical modeling of clouds. To do that, we need to be able to resolve them at a small scale. The current Intergovernmental Panel on Climate Change projections use a 50 kilometer grid, but that’s still not good enough. The scale we need to get to is about 10km or so. So once supercomputers can get us there, we’ll be on a much more solid footing to predict how clouds might be affected by climate change. If we tried to run climate models at that resolution now, it would simply take too long. The rule of thumb is that we’d like to simulate the climate a thousand times faster than it happens. So simulating three years in a day is our rule of thumb. If we increase our resolution from 50 kilometers down to 10 kilometers, that increases the computation demand by a factor of 125. At that point, you’re doing 9 days in a day. We can’t afford to do that and make the kind of projections that policymakers need in the next century. Climate model resolution of California. Source: LBNL. What will we learn about California with better climate models? Temperature changes are happening faster in the mountains than in the valley. So climate change in California is locally specific. A big questions is how much snowfall we’ll get in the future. That’s going to hinge on what the temperature is at the peaks of the Sierras. So knowing how fast the temperature change is going to happen at the peaks is going to make a big difference to our water supply. Local climate predications are really important for state and local policymakers. How should building codes be changed? How will local areas adapt? We need accuracy at the state and local level to pull off that planning. If you can resolve clouds better in the future, will that change overall projections about climate change? I’d be shocked if they did. The physics of climate change is really basic. We’re not going to get out of global warming. We know based on the projections that we’ve had in hand for the last 20 years that the time to act is now. The longer we wait, the harder the solutions are to avoid dangerous levels of climate change. What better resolution of clouds is likely to give us is a better idea of changes in rainfall. That’s really important to our water supply, our forests, and our crops. Higher resolution will also give us better predictions of climate change extremes, like when droughts happen or the impact of downpours on rivers and dams. We want to know about climate change that goes bump in the night. We’re concerned about abrupt climate change – the type that occurs quickly over a large region, like the melting of the permafrost. We’re also worried about extreme climate change – intense, highly-localized changes like heat waves, hurricanes and tornadoes. Both of those are stressors on society and the environment. They’ve been difficult to simulate since we haven’t had the computing power. But now, thanks to advances, we’re getting there. The science is very basic, then why are we not doing anything to stop it? It is not correct to say the science is very basic, otherwise why would we need supercomputers to attempt to predict it? The real issue is whether water vapour and clouds will have a positive or negative feedback effect on warming caused by CO2. This we do not know and cannot compute at present. We don’t know what combination of factors have caused past changes in climate so how can we be so sure that we know we are the main cause now?